Denny Jump (Bellevue, WA, United States) on 12 October 2017 in Landscape & Rural. While enjoying our first visit to Washington State's renowned Skagit Valley, Barbara and I enjoyed the autumn atmosphere as we visited a few nursery's to see their Autumn displays of flowers and pumpkins. I noticed this mountain peak peering over the lower range of the valley.....I could not be sure about the Mountain's name until today, October 12, when the amazing Steve Rice advised me of the name...it is Mount Shucksan. My gratitude to Steve for "being there!" Steve - You are the Best! such beautiful composition, layers, clouds, colors & lights! 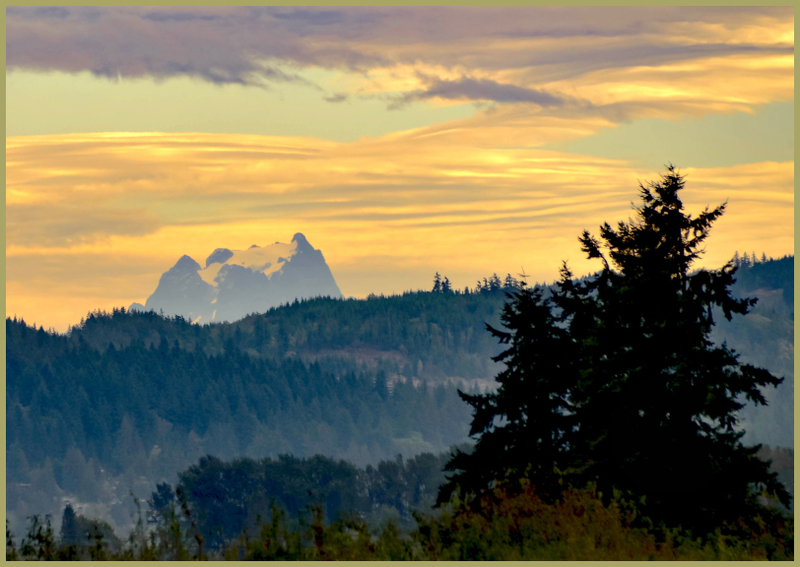 A beautiful shot of Mount Shucksan, Denny. @Steve Rice: AHHH!! THANK YOU SIR!! ;-) I was thinking that the peak was a bit "removed" from the Cascades are actually more to the east. I will amend my post above and give credit where it is due ;-) You are the Best, sir! Thank You!! Gorgeous light that illuminates the sky!! Fabulous light and tones. I like the visual tension between the mountain and tree - both are very well positioned in your composition Dennis.